Every Friday, members of Class 9 volunteer to plan, prepare and lead their own Collective Woship for the class. It's a lovely way to end our week and bring us all together and the themes have ranged from 'Gifts from God' to 'Love'. The pupils have really embraced this time of our busy week and have encouraged each other to end the week on a positive note with some powerful messages to think about and reflect upon. 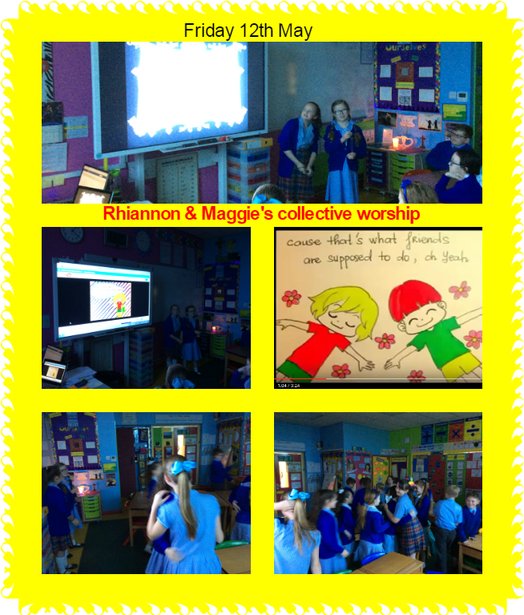 This week, Maggie and Rhiannon chose to focus on 'Friends and sisters' and chose a perfect song and video to highlight the key thoughts in their presentation. The whole class joined in and now the song is stuck in our heads, we're often found humming it throughout the day. A great way to remember your wonderful Collective Worship girls. Well done!